Been waiting a long time for a ride like this! Almost looks like a Christmas scene! And check out the temp on the bike computer! 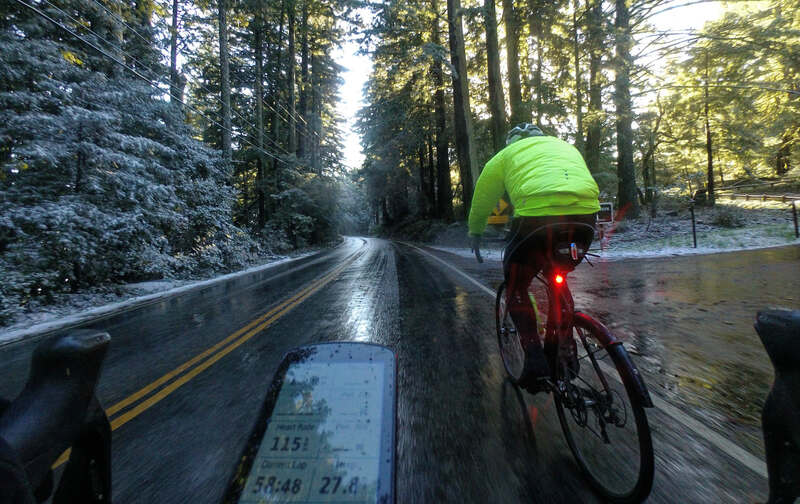 We knew it was going to be cold, we knew there might be snow, we knew it wasn’t going to be a fast ride. We hoped it was going to be fun. A win on all counts! Pretty sure this was Kevin’s first ride into the snow. That’s curious, given that he’s been riding for quite a while, and I’ve seen quite a bit of snow up on Skyline over the years. One of my most-memorable rides, at least 10+ years ago, I got to watch the transition from light rain to snow while climbing Kings. Pretty amazing, something I’ll never forget. That wasn’t going to be the case today as the rain & snowfall had finished just prior to the start of our ride. -Thermal bib tights with wind-stopping material on the front. Keeps your legs warm even in a cold rain. -Booties over the top of toe warmers, along with wool socks. Kevin next to someone else’s mini-me snowman. Yes, that’s 4 layers on top. We assumed we’d be taking off the windshell jacket as we climbed Kings, but we never over-heated, probably because we were riding at a pretty easy pace. The temp at the bottom was about 33, gradually dropping to 30 near the top of Kings, and finally 28 across most of Skyline. We stopped at the Skegg’s Point parking lot to check out the view, as well as a couple of snow sculptures. 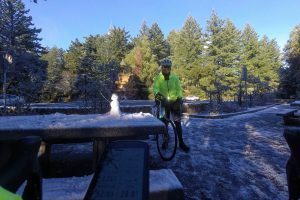 I learned from experience that it is NOT a good idea, on a bike ride, to build a snow man. Been there, done that, didn’t notice how the gloves were soaking through and had the nastiest, most painful descent ever as fingers could barely work the brakes. Not today. Even so, the descent was not much fun because you were no longer keeping the engine going while essentially dealing with a 30mph wind. It was a very memorable and beautiful ride.